Applying white paint to the trunks of fruit trees aids in repelling fruit boring insects. According to the Missouri extension service, painting the trunks of the fruit trees in early spring, prior to any leaf growth, will repel certain species of moths and grub larvae from attacking fruit trees. While painting the trunks is effective, it is only part of a maintenance to the tree that must be performed. 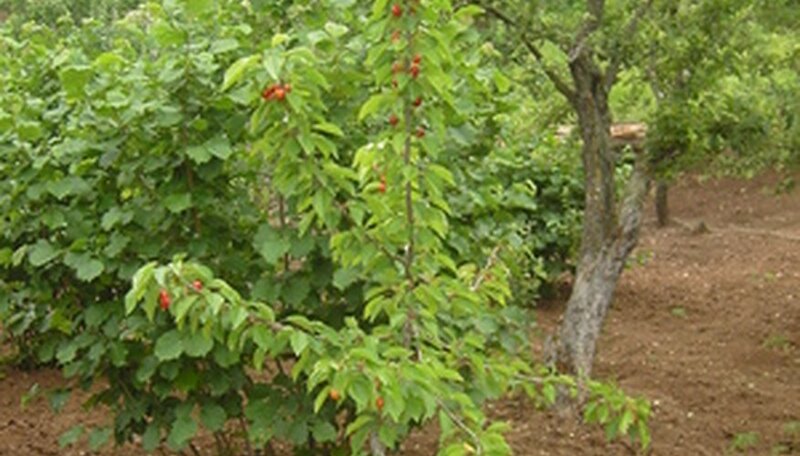 Healthy fruit trees are less likely to be attacked by trunk borers than trees that are less cared for and maintained. Wear the gloves on your hands and remove all weeds and extraneous plant growth from around the fruit tree. In most all cases, the soil from the trunk area and out to the drip line of the fruit tree should be kept relatively weed-free. Excess plant growth around the base of any fruit tree may create unwanted competition for moisture and nutrients. These types of conditions may cause an unhealthy fruit tree. Place all dead limbs and removed weeds from the fruit tree to a compost pile. The compost pile must be located a distance from the growing area because some insects may migrate back to the fruit tree orchard. Apply a white latex interior paint to the trunk of the fruit tree. Paint the trunk using the paintbrush from the base, at the soil line, up to the first set of lateral limbs. Inspect the trunk one week later. Apply another coat if the paint is washing or peeling from the trunk. Any small holes that are appearing from under the new application of paint must be thoroughly inspected. They may represent an infestation of other small grubs or larval tree borers. Consult your local agricultural extension service for any specific insecticide treatments if the infestation is too great. Exercise caution whenever applying any chemical to your garden and trees because beneficial insects may also be harmed. Remove all leaves and dead limbs from the base of all fruit trees. Allowing deadwood and leaves around the base of the fruit tree will encourage insects to inhabit the area. Keep children and animals from any area that has been treated with a chemical. Follow the manufacturer's labeling when applying any chemical, and keep all runoff from any aquatic areas.